I try to bring the beauty, magic and mystery of nature to viewers by amplifying nature’s essence. Scientists, innovators, and inventors throughout history took the time to observe nature and her connective rhythms. But now society plugs us into the Internet, and while that can open doors, sometimes too much of being Internet-connected disconnects us from the mysteries of the natural world that are transformational. I want to help show how nature’s interconnectedness can lead us to discoveries about our world and ourselves. Sometimes when people look deeply into these images, they relax and find a tranquil place in the soul, as one would by taking time to be at peace in nature. At other times, the photographs can refresh, excite, and energize one’s soul, as if one were standing by a waterfall. The images have been said to be dreamlike, healing, Zen meditative, inspiring and thought provoking. My technique uses movement to create a sense of wonder through colors, textures, memories, and the seasons. Everything within the viewfinder becomes visibly interconnected when objects merge with the motion of the camera as the image, the “lightgraph,” is taken. Putting the images into categories was extremely challenging as everything is interconnected. Please enjoy the work and check back for more additions regularly added. All images are limited editions for sale and represent over 35 years of work. TO VIEW: Please click on the thumbnail below to see a larger version of the art work. There are no boundaries in nature, with everyone and everything interconnected. Where a river stops cannot be defined, nor can the end of the sky. In my lightgraphs no objects have clearly defined borders as they merge their core essences together creating visual abstracts of light. In some cases the images resemble microscopic images, as if the core elements of what is being photographed has emerged to be recorded. It’s my hope that with these elements revealed the viewer has an opportunity to discover something about the natural world representational photographs cannot convey as nature reveals herself. Painting with the camera can create the sense of being personally close to an object through colors, textures, memories, and the seasons. With a landscape that’s exemplified because of their never-ending vastness that somehow surrounds us in an embrace. For me landscapes inspire contemplation, and patience. That and the sensation of being at home, welcomed by nature’s warmth. Stability, strength, integrity: words we use to describe trees. From our most ancient texts trees have become symbols for people to find strength in. How they reflect human nature, throughout the seasons, inspires me. Painting with the camera depicts their resiliency while commotion surrounds them. They remain more defined in the photographs while their surroundings have a swept away look. For me that reflects the strength of the human spirit. Our bodies consist of the same proportion of water as the earth. We are creatures of the sea. The draw of the ocean has been written about time and again. There is something more vast and more mysterious about the sea than anything else on earth. It’s something similar to the vastness and mystery of the universe itself. Our planet is just one in our solar system which is connected by the vastness of space. Is the relationship we have with the ocean a microscopic reflection of the relationship our Earth has to space? How people interact with the ocean, from feeling at one under sail with the winds at the back to simply watching waves lap the shores, transmits a calmness, a wholeness. That peace is something I wish to convey in my work. To take a photograph of a flower is obvious. 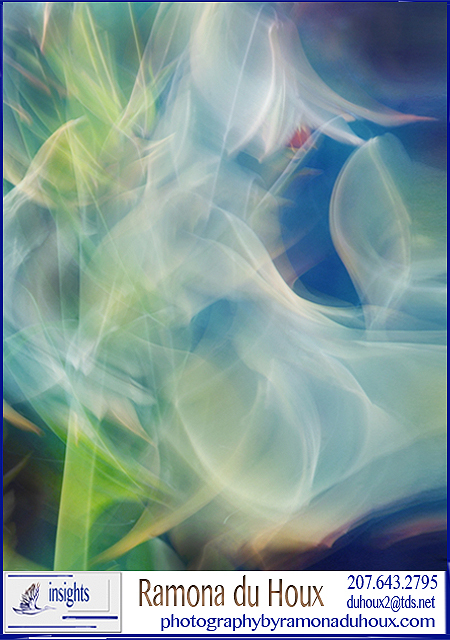 To show the energy and light within that flower and how it relates to its surroundings is always the challenge. Viewing these flowers allows us to think more about life. The images can calm, excite or balance our souls by taking us away from our daily routines. Society moves at an ever-increasing pace; with cell phones and text messaging many people don’t take the time to look around them, to reflect. There is of course a time and place for these technologies, there is also a time and place for contemplation. Nature provides pools of wisdom in reflected objects if we take the time to look. Taking a moment or two to find stillness coupled with a rush of discovery energizes me in a balanced way. With these images I hope others will find that solace. Water, soft and supple and rocks hard and unforgiving create a balance. They exist and form the nature of each-other. The water molds the stones, the rocks determine the waters flow. This relationship in nature we carry in our souls. When the ice age carved out our landscapes dramatic shifts occurred. Some were sharp, steep transitions where waterfalls were created. For me the energy from the ionizing water as it cascades over a waterfall clears my mind so I can look at challenges afresh. The rush of water awakens something deep within the soul. In my photographs I hope to convey that excited rush of creation with a balance of where the earth now resides. Birds represent so much in our cultural histories; freedom, strength, liberty. They also predate human existence and are related to dinosaurs. With grace these ancient avions keep watch on human activities from the air. What they mean to us is an ongoing discovery and discussion I’d like to have. The way that manmade cityscapes reflect glacial rock formations or undersea coral reefs has always fascinated me. Is it by design that our cityscapes resemble mountains of granite, carved from the ice age? Rock and coral reef patterns emerge as I paint cityscapes with the camera. This curious relationship has led me to wonder about our relationship to stones large and small. Some artists work with stone to create monuments and buildings that are designed to inspire generations in our democracy. For me they come alive, in revealing mysterious ways, with the interaction of people who visit them. How we interact in our surroundings, becoming a part of wherever and whatever we may be associated with is key to my photographs of people. How much do we carry where we are with us, how much do we disregard this? How much do people who surround us influence us, or us them? Sometimes new dimensions open as one follows your soul instincts with a clear head. Often that’s when discoveries can be made. Shapes, objects and the unexpected can come to life. And new questions arise. Is what we perceive real? What doors of perception can the camera open up? 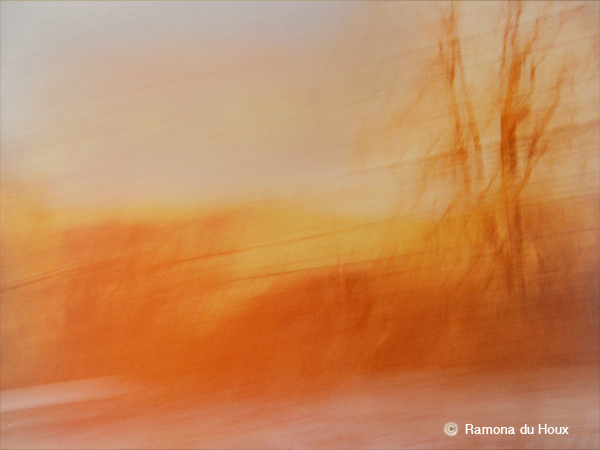 Painting with the camera helps me to explore the simultaneously harmonious and strained relationships between animals and the natural world and the similar relationships between animals and their fellow kind. It also allows me to artistically investigate the complex manifestations of personality that we as humans project upon animals, and that they intrinsically possess. To purchase any of these images in limited edition prints please contact me here. I’m represented by Gallery Storks in Tokyo, Japan and Gallery Insights of Solon, Maine. 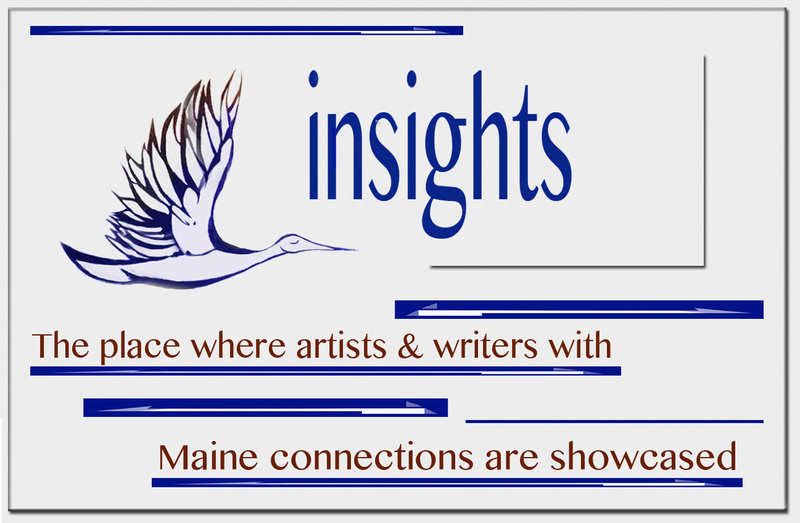 And a member of the Maine Artist Collective which exhibits regularly. Please click on the links and go to the galleries. 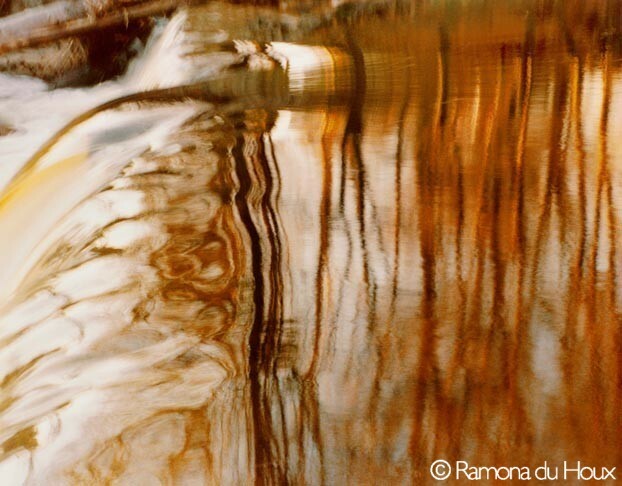 This entry was posted in abstracts: lightgraphs, animals, birds and new dimensions, Cityscapes and monuments, flora, landscapes and seascapes, people and animals, reflections, waterfalls and trees and tagged amazing photos, Flowers like watercolors by Ramona du Houx, Gallery Storks, Landscapes like paintings by Ramona du Houx, Maine artist, Maine artist Ramona du Houx, New Photo technique by du Houx, Ramona du Houx photos, Unique photo art. Bookmark the permalink.